Gyeongju, Korea – Over 300 delegates have gathered in Korea’s historical city Gyeongju for the 78th PEN International Congress. The Congress was launched by host centre President Gil-Won Lee, which this year explores themes around Literature, Media and Human Rights. PEN’s diverse and unique community of writers and members gather each year to share ideas, discuss new campaigns and initiatives, highlight emerging issues and challenges to freedom of expression around the world. The Congress will see keynote speeches by Nobel Laureates Wole Soyinka and Jean Marie Gustave Le Clezio as well as training sessions and workshops, lectures, literary events and networking sessions. The annual congress is an opportunity for members from all centers to share their diverse expertise and experience. At the opening Ceremony, PEN International announced its Declaration on Free Expression and Digital Technologies, which will address concerns around digital technology, particularly freedom of expression through digital media. 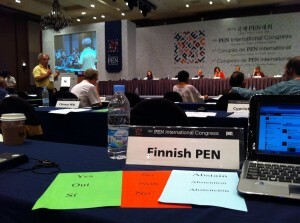 PEN plays a global role in promoting literature and protecting freedom of expression. PEN International celebrates literature and promotes freedom of expression. Founded in 1921, our global community of writers now comprises 144 Centres spanning more than 100 countries. Our programmes, campaigns, events and publications connect writers and readers for global solidarity and cooperation. PEN International is a non-political organization and holds consultative status at the United Nations and UNESCO. PEN International Campaigns & Communications Manager Sahar Halaimzai.